When OKLAHOMA! first opened on Broadway, we were in the middle of a war. Its seemingly simple tale of people in the ‘territory’ during the nineteenth century dealing with the prospects of the future struck something profound in the psyche of the country. The fact is that the show was also really good – good storytelling, good music, good lyrics, good dancing, good characters, good performances . But over and above people’s delight in seeing a successful work of musical theater, something about the story cut to the core of what it meant to be an American, living in America, in 1943. I thought of this recently when I saw two distinctly different modern productions of the show, one in Washington, D.C. and one in Portland, Oregon. While the productions were very different, they both tapped into something that wasn’t part of the America explored by Rodgers and Hammerstein and their collaborators in the 1940’s. Both productions cast African Americas. But very differently. And since both were rather brilliantly directed, by Molly Smith in Washington and Chris Coleman in Portland, each one made OKLAHOMA! about something very American for today. Molly Smith’s production was a post-color blind production. She was very specific in who she cast, inspired by a sense of making the world of the play very much a world of different races working together. Farmers and cowmen have to be friends, remember; Native Americans, African Americans, Hispanics, and white people need to be friends as well. That was a point she wanted to make, and all those races were represented in the cast. Even if the assortment of different races can’t be completely friends, they need to dance together. Smith cast Laurey and her Aunt Eller (of course while everyone refers to her as “Aunt Eller,” she is only Laurey’s true aunt) with African American actors. The problems Laurey encounters in the play – primarily her inability to make up her mind about whether she should be with Curly or Jud - are underscored, subtly, by her desire to find her place in the world. We see she is black, and can’t help but wonder whether that factors into her confusion. But her Aunt, the character who provides the central spoke around which the play circles, is the wise and knowing woman who understands what is best for Laurey – and for everyone. She the one who ‘bends the rules’ a little to force Curly’s trial to take place then and there. She’s the one who explains to Laurey that ‘you got to be hearty to survive.’ And she’s the one who explains that while she’s no better than anyone else, she’ll be damned if she ain’t just as good. Without adding anything to the text, without changing the look or feel of the Oklahoma territory, without making the mistake of changing the sound of the music, Molly Smith has created an OKLAHOMA! for these times – and it is heartening to know that D.C. took her production to heart. In fact, it opened the Arena Stage’s extraordinary new Mead Center last fall, and made a sold-out repeat return this past summer. It was far from a safe choice to open a new theater complex; in fact one member of the board said that when she heard OKLAHOMA! was the show Molly would open with, she was very disappointed. She told me this after she was seeing the show for the 14th time. Among the sold-out audiences were those who hadn’t much thought about OKLAHOMA!, and they loved it. And those audiences were racially mixed. Just when I thought Molly Smith had created an OKLAHOMA! for these times, along came Chris Coleman, at Portland Center Stage, with another contemporary, and very different, idea. He wondered whether the story of OKLAHOMA! could exist in a community comprised entirely of African Americans. It turns out his research revealed there were many black citizens of the Oklahoma territory, many of whom had migrated up North from the troubled South. There was even a photograph of a town meeting in Boley, Oklahoma – one of the biggest of the fifty all-black towns in the Oklahoma territory – in the program. Coleman cast everyone – except Ali Hakim, the true outsider (he was played by a white actor) – with African American actors. And the result was astonishing. This wasn’t a ‘black’ show; this displayed a distinct community of people, and a varied lot they were, handling the human situations and emotions of Rodgers & Hammerstein’s OKLAHOMA! Who would take Laurey to the box social, whether Will Parker would ever figure out how to hold on to his $50 so he could get Ado Annie, how Curly was going to remove Jud as his rival for the girl he wants – all of those classic OKLAHOMA! moments were there, but with far different resonances. Bold, these people are. Ado Annie had visibly ‘rounded up,’ but she know exactly what she was going to do about it – until she realized she had no idea how to deal with being the object of two affections. Jud was as strong a personality as Curly, so their relationship was more a confrontation of equal-minded, and equally stubborn people. Yes, Curly pushed him in the smokehouse as far as he possible could, and yes, Jud expressed his pent-up frustrations about not having a ‘real girl.’ Aunt Eller commanded everyone’s respect, but she was more like the cheerful center of the party. The story had power, but quite a different kind of power than any production I have seen. Yet, like Molly Smith, Chris Coleman made no changes, and the sets and costumes were of the correct historic period, and the music was not rearranged. The audience I saw it with, recognizing something familiar done in a sparkingly different way, stood up and cheered at the end. “Reinterpretation” is a tricky word to use in the business of revivals. 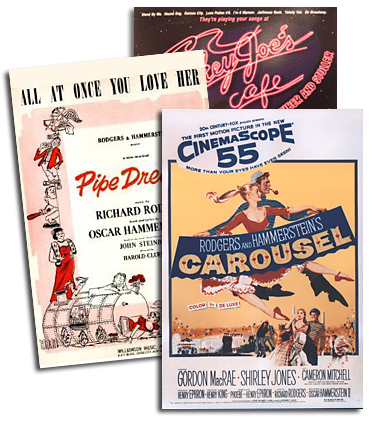 I have learned to believe, in the years of being responsible for the remarkable catalogue of shows by Rodgers and Hammerstein, that the best way to reinterpret their shows is to dive in, see what is there, and honor that. Dig in, smart theater people, and you’ll discover the amazing construction that forms the core of every Rodgers & Hammerstein musical. And layered on top are some of the greatest characters, songs, and reasons for dances in the musical theater canon. If anyone is curious about how OKLAHOMA! might be reinterpreted for today, get yourself to Washington’s Arena Stage and to Portland’s Center Stage. Two remarkable assemblages of theater artists are doing great honor to Rodgers & Hammerstein and OKLAHOMA! and making it feel as relevant as any current work of musical theater.